A greasy pan can be a frustrating thing to navigate, especially if you shy away from chemical-laden home products. When simple soap and hot water won't do, here are a few tried-and-true tips. Bonus: You can use some of these on your stove top, too! Soak. Never underestimate the power of a hot water soak. 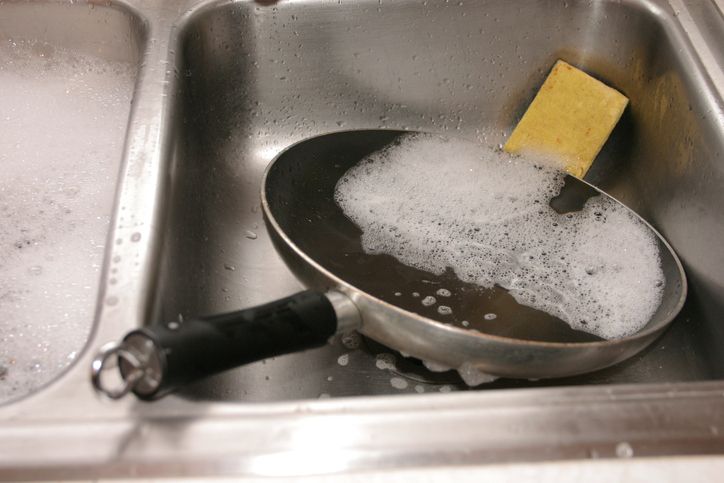 Fill up your sink with seriously hot sudsy water, and let your greasy pans soak for a few hours. This will save major elbow grease when it comes time to scrape away food batter. Baking soda. Simple soap not working? Sprinkle baking soda on your dirty dish (or stove top) and give it a go. Careful with sprinkling straight baking soda on non-stick cookware, though. Dilute it in water to avoid damaging your pan. Vinegar. If water isn't working, turn to vinegar to power through grease and grime. Try keeping a spray bottle by the sink with equal parts white vinegar and water. Salt. A salt scrub is a great way to clean iron pans that have been seasoned. Scour your cookware with coarse salt and then rinse with hot water.